Today we're announcing the name of the last winner of our 12 Days of Christmas contest. Thanks so much to everyone who joined in the fun! Which of Michele D'Amore's collections was named after the wife of French King Louis XIV? Click here for a peek at the Antoinette line by Michele D'Amore! Congratulations! We are sending you an email to get your mailing address. We're back with the winner's name for Day 11 of the giveaway (the Day 12 winner will be posted on Thursday). Even though the 12 Days giveaway is over, be sure to keep visiting our blog! We'll be showcasing new fabric lines, offering tutorials, hosting more giveaways, and sharing a few other exciting things that we can't tell you about yet. What is the name of the award our Kanvas booth won at Fall Quilt Market? Welcome to the last day of our 12 Days of Christmas contest! We hope you've enjoyed the project ideas you've seen here, as well as answering our trivia questions for a chance to win fat quarter bundles. 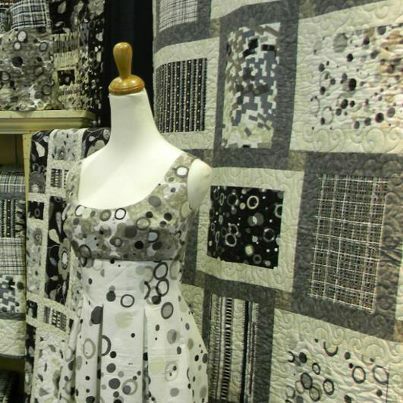 Even though this contest is over, we hope you'll continue visiting our blog for tutorials, more information on our designers and new collections, and general sewing and quilting fun. 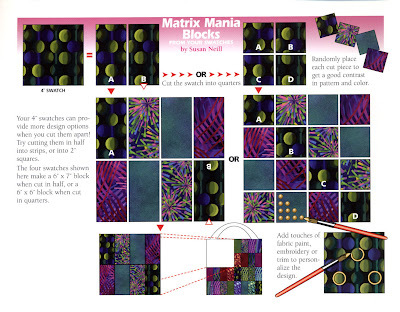 Today we're sharing a project starter--some block-making inspiration. 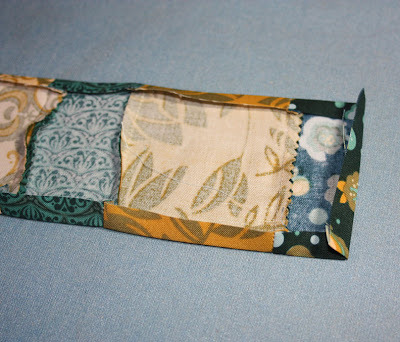 The instructions are for using 4" squares, but you can easily adapt to smaller or larger squares. Have fun! Click here for a printable version of the Matrix Mania Blocks. 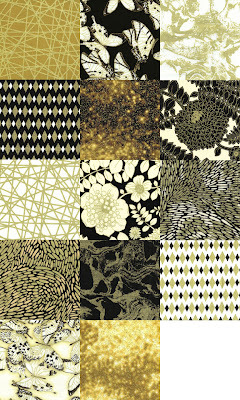 The Touch of Luxe collection from Kanvas would make rich, gold and black blocks. It's the last day to win a fat quarter bundle! To enter the giveaway, leave the correct answer in the comment section below this post. 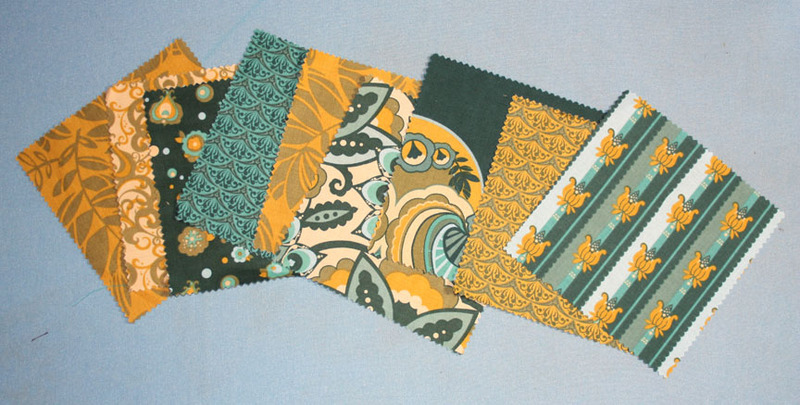 The winner will receive this fat quarter bundle of Nancy Halvorsen prints! Details: This giveaway is open through Wednesday, December 26th at 11:59 EST. On Thursday, we'll randomly draw a name from the commenters with the correct answer, and we'll post the winner's name here on the blog. How many prints in Nancy's Holiday Favorites have holly in them? (Note: Each day, we make a numbered list of everyone who answered the question correctly. Then we use random.org to select a number from the correct entries, and match that number up to the numbered list of names. Also, have you signed up yet to follow our blog? You can use the Google Friend Connect button or enter your email address so that you receive notification when we've added a new post (both options are on the right sidebar). Be the first to know about new fabric lines, giveaways, and tutorials we offer! Looking for one more last-minute gift idea? 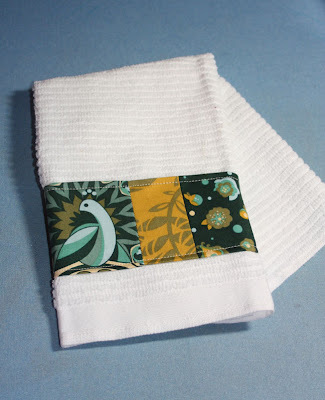 This quick project would be a lovely hostess gift or stocking stuffer. Choose some plain dishtowels (ours measure 16" x 18", but any size is fine) and pick out coordinating charm squares (or scraps) to create a patchwork border. We are using the blue colorway of Dianna LaFerry's Feathers and Fancy collection. You can see more of Dianna's work here. 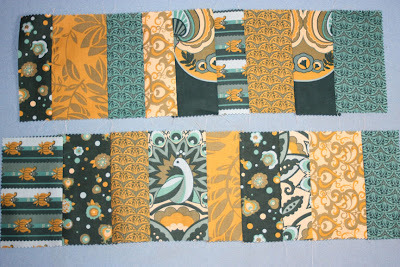 If you're using charm squares, cut each square into two pieces, varying the width of the pieces. 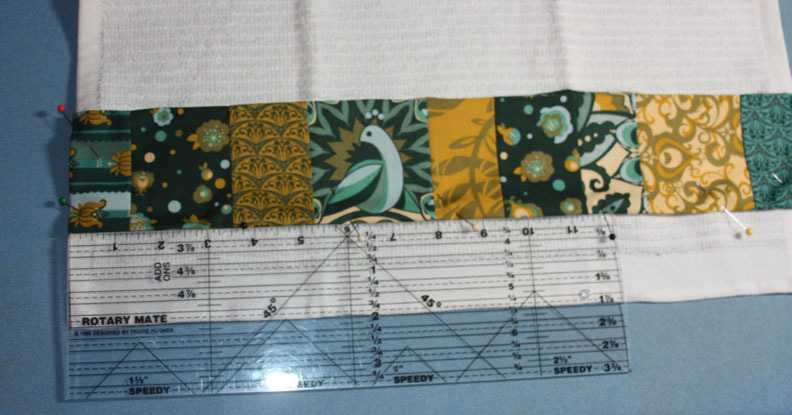 If you're using scraps, cut pieces that are 4" tall in a variety of widths. Stitch the pieces together lengthwise to create a patchwork strip, varying color placement and strip width for maximum interest. Measure the width of your towel. 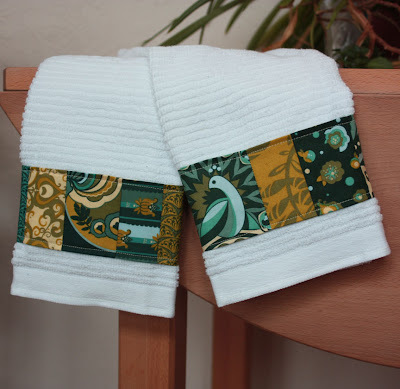 Make two strips that measure the towel width plus 1", or one strip that is long enough for both towels. 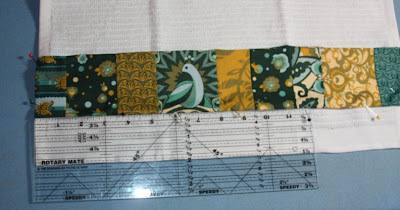 Trim each pieced strip to measure 3-1/2" wide. Press the long edges under 1/4" to create a finished edge. Press one short end under approximately 1/2"
Starting with the folded short end, position the strip on the towel, approximately 2" up from the towel bottom edge. Pin in place. 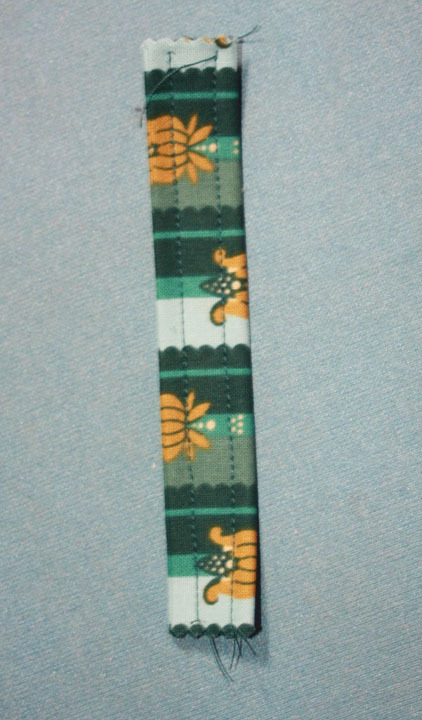 Topstitch along the outer edges. When you reach the second short end, fold under so the finished patchwork edge touches the towel edge, pin, and continue topstitching. A close-up of the topstitch patchwork. The completed towel, all spread out. Our towel used nine different pieces; your number may vary depending on the width of the strips you use and the measurements of your towel. The finished towel, ready to use. Make two for a nice gift set. Win a fat quarter bundle! Details: This giveaway is open through Sunday, December 23rd at 11:59 EST. On Monday, we'll randomly draw a name from the commenters with the correct answer, and we'll post the winner's name here on the blog. What is your favorite FREE Kanvas project? Congratulations, SewCalGal! We've emailed you for your mailing address. 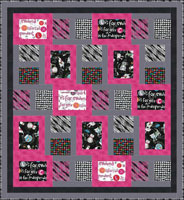 Here is an image of the Paw Paw Games quilt by Stitched Together Studios that SewCalGal liked best. The pattern can be found here and uses the C is for Cat collection. Be sure to stop back tomorrow for the last day of our 12 Days of Christmas giveaway contest! Here's a quick-stitch project: finger pincushions! 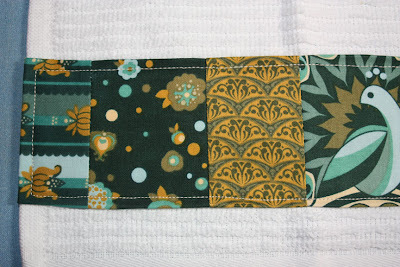 This simple little hand sewing project by Linda Leathersich and Stephanie Sheridan of Stitched Together Studios is perfect for charm squares or scraps, and all of your quilting friends will love them! 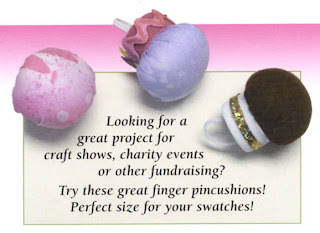 Click here for the pdf pattern to make these finger pincushions. Have you seen Maria Kalinowski's Needles and Pins line for Kanvas? (You might recognize it from our blog header.) These bright and modern sewing themed prints would be idea for making finger pincushions. Details: This giveaway is open through Saturday, December 22nd at 11:59 EST. On Sunday, we'll randomly draw a name from the commenters with the correct answer, and we'll post the winner's name here on the blog. Which Michele D'Amore collection features vintage sewing motifs? Patricia, please email us at sewinlovewithfabric (at) gmail.com with your mailing address. Thanks! Here's another quick and easy stocking stuffer idea. 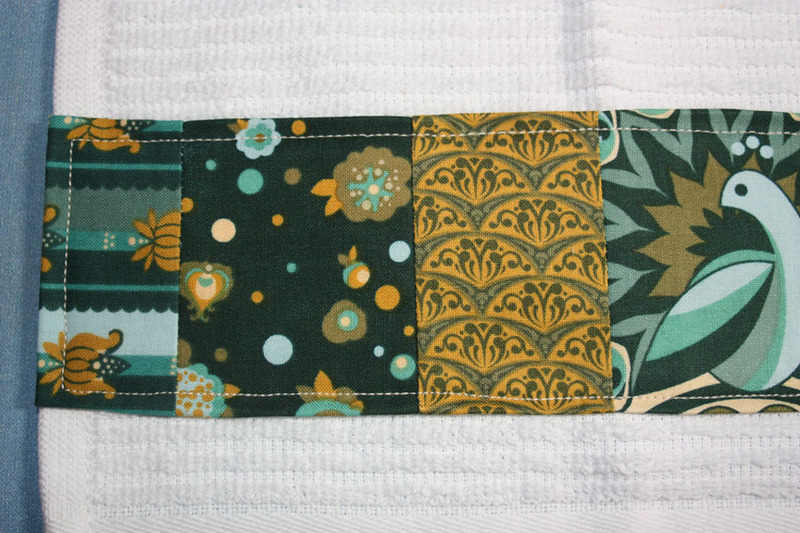 What better place to show off favorite fabrics than on something that gets used every day? 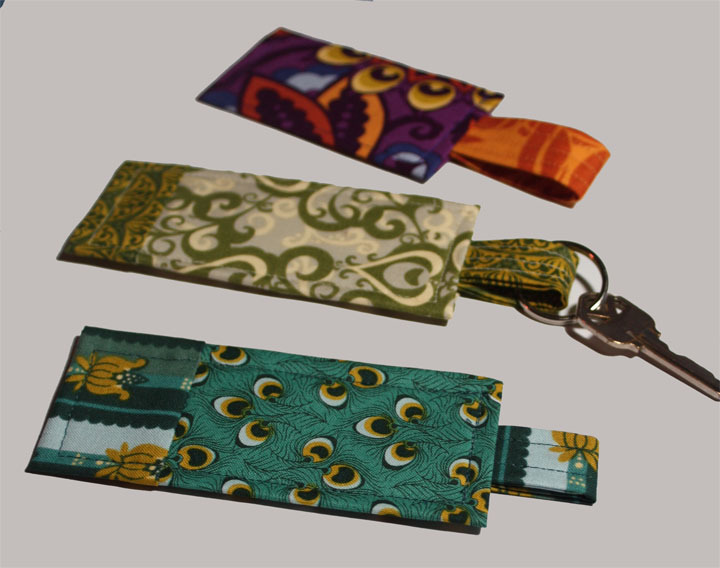 Keep your keys handy in style! These key fobs are made using Dianna LaFerry's Feathers and Fancy collection. If you aren't familiar with these prints, head on over to our website and check them out! You can also visit Dianna's website here. 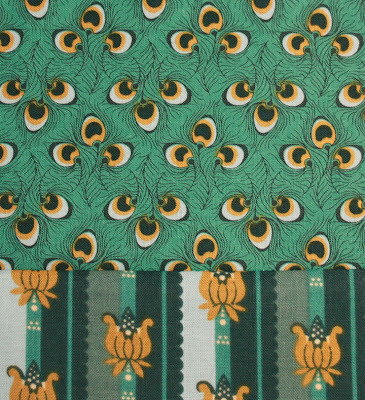 There's a unique double scallop border, the peacock feather print you see here, some stylized peacocks, and a range of really neat coordinating small prints. 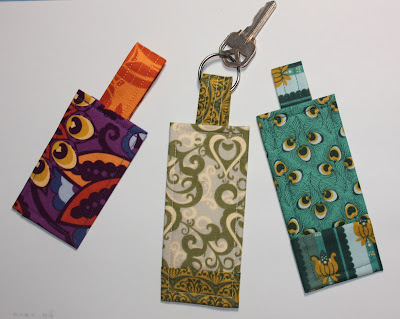 This key fob pattern uses just two 5" charm squares and a 2" x 9" piece of fusible interfacing--super simple! Cut your main print into a 1" x 5" piece and a 4" x 5" piece. Cut your coordinating print into a 2" x 5" piece and a 3" x 5" piece. 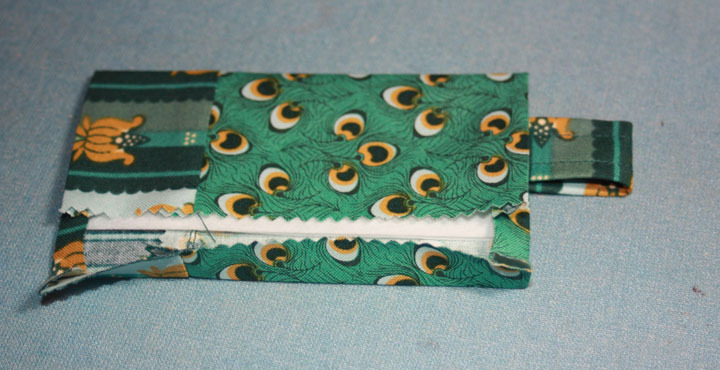 Sew the 2" x 5" coordinating print piece to the bottom of the 4" x 5" main print piece. Fold and press the 3" x 5" coordinating print piece in half lengthwise, wrong sides together. Open and fold/press long raw edges to the center crease. Fold the entire piece in half again. 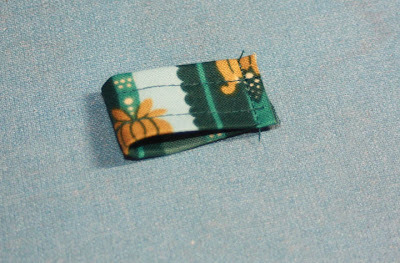 Topstitch 1/4" from both long edges to secure. 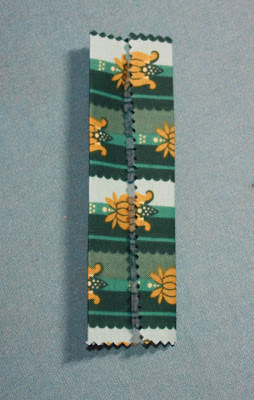 Trim to measure 3" (if you'd prefer a longer loop, trim less). 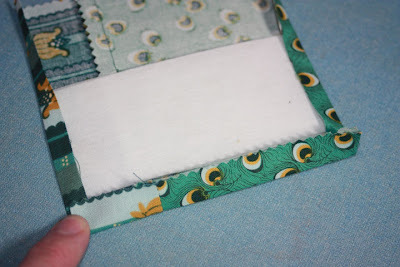 Fold in half and stitch along the raw edges using a 1/8" seam allowance. 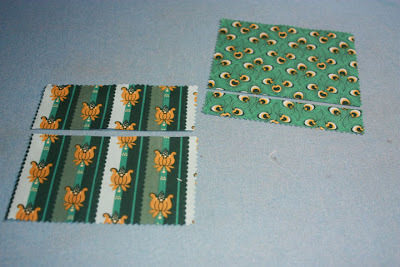 Fold the top and bottom edges (they look like the right and left edges in the photo below) in 1/4" and press. Fold the right edge in a generous 1/4" and press. Fold the interfacing in half to create a 2" x 4-1/2" piece. The fusible sides should be facing out. Position the folded interfacing inside your pieced fabric, lining one long edge up against the raw edge of the right folded side, as shown below. 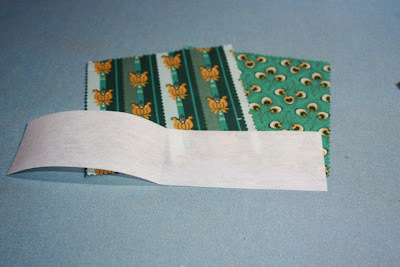 Press your folded edges again to lightly secure to fusible interfacing. Note: Be careful that your hot iron doesn't touch the fusible interfacing! Fold the opposite edge over the interfacing and press to secure against the fusible web. Create a finished edge by folding the short side over the raw edge, covering all interfacing and raw edges. Top and bottom raw edges should still be tucked in. 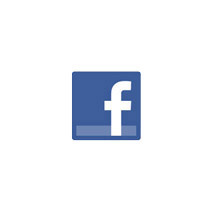 Insert the loop at the top. Topstitch around all four edges to secure. Add additional decorative stitching if desired. Feed onto a key ring. 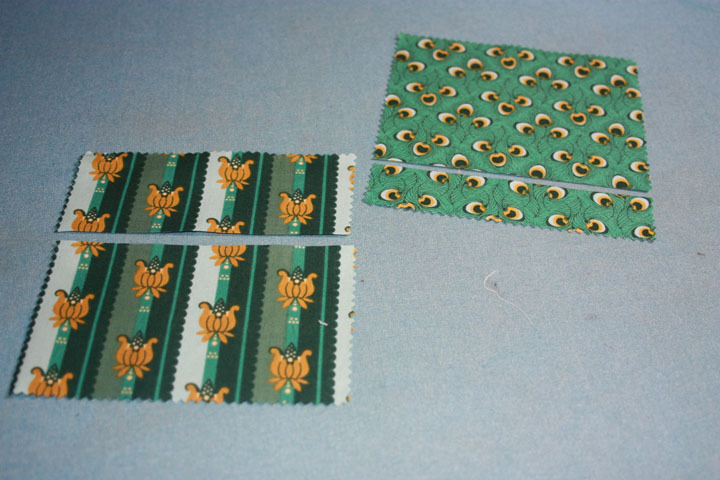 We varied the pattern slightly in our samples, making one fob without piecing and lengthening the loop on a second. Feel free to adjust the pattern to your tastes! 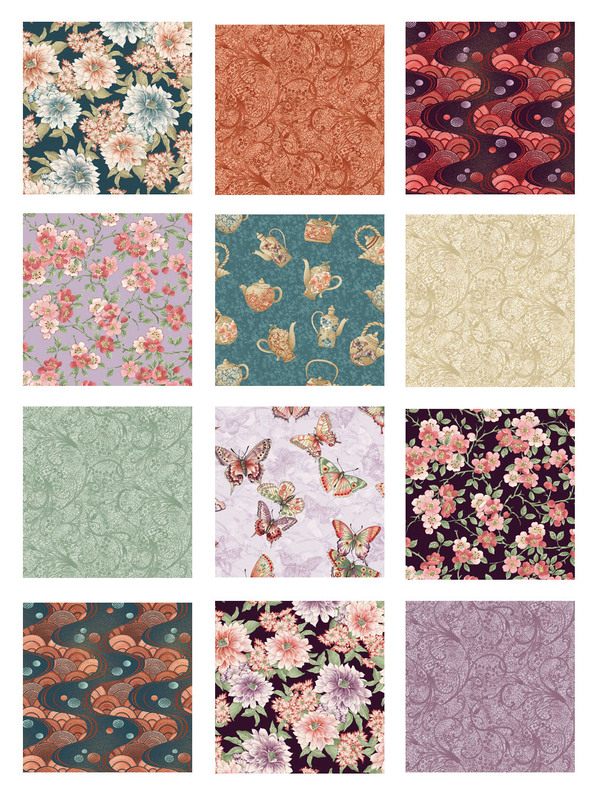 What is your favorite Kanvas FREE pattern? Details: This giveaway is open through Friday, December 21st at 11:59 EST. On Saturday, we'll randomly draw a name from the commenters with the correct answer, and we'll post the winner's name here on the blog. 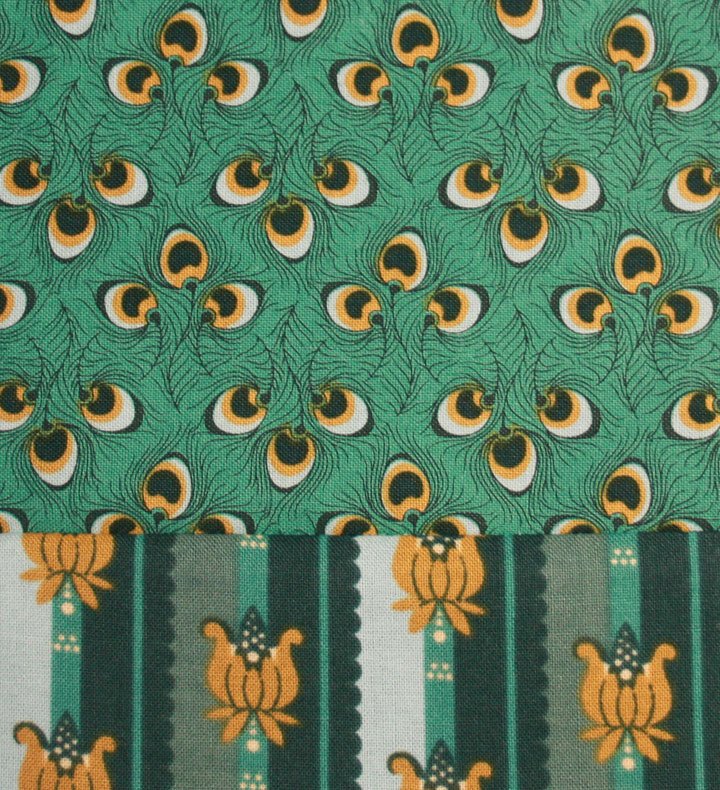 What are the names of the two FREE Googlies patterns offered on our website? Congratulations! We've sent you an email to get your mailing address. Have you finished your holiday shopping? If you haven't, you can avoid the rush and the crowds by making homemade gifts instead! Here is another free project designed by Stephanie Sheridan and Linda Leathersich of Stitched Together Studios, perfect for friends or coworkers! Use five 5" squares for each coaster. 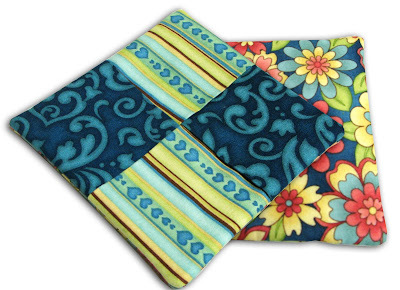 By folding them into rectangles or triangles, you can create two different looks. Our fabric recommendation: Try Tea House, a new collection with Asian flair. It features many small prints, which are perfect for these coasters, and has an air of elegance that will compliment your home. Click here for the pdf of this project. Details: This giveaway is open through Thursday, December 20th at 11:59 EST. On Friday, we'll randomly draw a name from the commenters with the correct answer, and we'll post the winner's name here on the blog. Market. Which pattern company is the dress from? So glad to see you today! Yesterday's project was for the kids; today's project is to do with the kids. We've got an alternative to cookie making, and it's definitely less messy than pulling out the frosting, sprinkles, and colored sugar. It's sugar free, too! All you need are some fabric scraps, fusible web, some cookie cutters, and your imagination! This homey plaid would make a cute stocking! Use this pine needle and cone print for a Christmas tree. Textured brown, ideal for a reindeer! Either of these next two prints would be perfect for a gingerbread man. 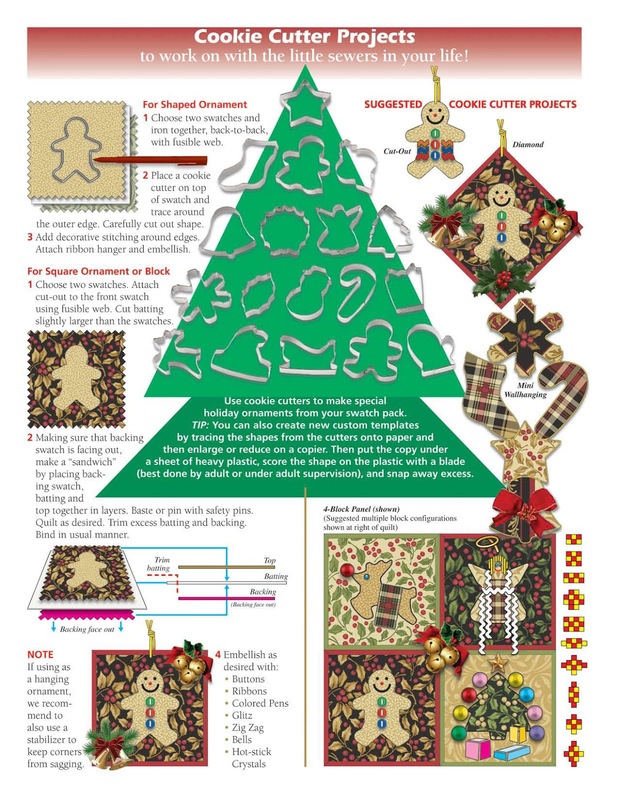 Use ribbons, buttons, other trim and fabric markers to embellish. Details: This giveaway is open through Wednesday, December 19th at 11:59 EST. On Thursday, we'll randomly draw a name from the commenters with the correct answer, and we'll post the winner's name here on the blog. The answer: "Mr. B" is Selim Benardete, founder and President Emeritus of Benartex. first to know about new fabric lines, giveaways, and tutorials we offer!